Edition Type: Open Edition Size Type/Largest Dimension: Canvas Size: 8 1/2" x 11"
"Boston Terrier Drinking Beer". 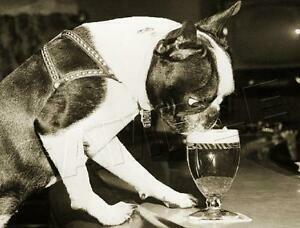 Here we see a very thirsty Boston Terrier bellying up to the bar and having a drink of beer! This canine photo art print is truly irresistible. BOSTON TERRIER Canvas Prints and Glossy Note Card Sets.